There was an era of American history when nearly every home came with carefully-defined rooms—a formal dining room here, a parlor there, a family room somewhere else, each one carefully walled off from the rest. That’s not so much the case anymore. Today, open floor plans are very much en vogue. Open floor plans, of course, are simply those where there aren’t walls to differentiate the dining, living, kitchen, and family areas. It’s all presented as a one fluid space. Open floor plans are so popular, in fact, that an overwhelming majority of new constructions employ them. Before buying an open floor plan house of your own, it’s worth pausing to consider some of the potential benefits and drawbacks of this setup. To begin with, here are some of the main selling points. · Open floor plans make your home feel much larger. Rather than having each room segmented off and limited in its square footage, an open floor plan just gives you one big chunk of space. In other words, it can make your home feel larger, and in fact it actually is a bit more spacious, without the unused areas you sometimes find in traditional floor plans. · Having an open floor plan makes it easier to socialize. Imagine: Dad’s cooking dinner, two kids are sitting at the dining room table doing homework, and Mom’s on the couch, reviewing a few files from work. In a traditional floor plan, this arrangement would involve family members being isolated in separate rooms; but in an open floor plan, everyone can be together, even when engaged in these different activities. · It improves the lighting, as well. Open floor plans do away with interior walls, allowing the natural light from each window to permeate a larger area. The result is a home that feels much more easily illumined by natural lighting. · An open floor plan can improve safety. Certainly, if you have younger kids, an open floor plan makes it easier for you to keep an eye on them at all times, no matter what other activities you’re involved in. 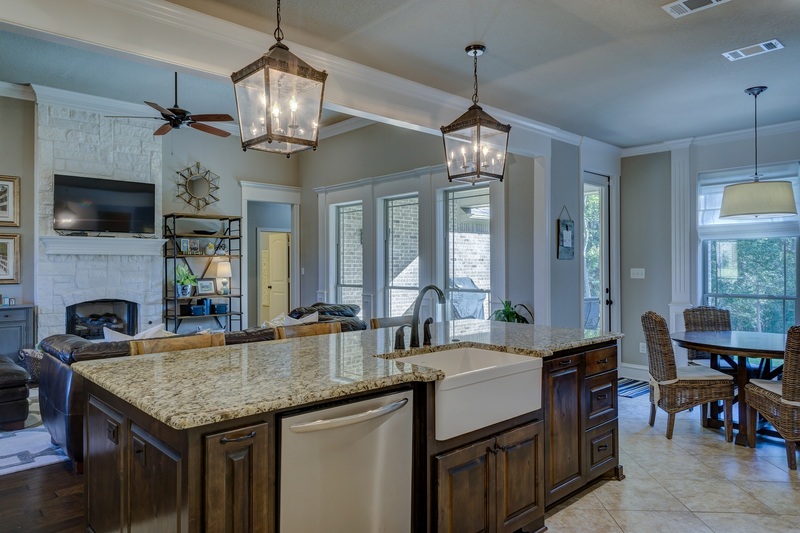 · Bottom line: Open floor plans provide more usable space. Having one big open space simply lends itself to flexibility—which really comes in handy when you’re entertaining. Being able to invite everyone to just mix, mingle, and make themselves at home is one of the true upshots of an open floor plan. With that said, there are also some noteworthy downsides to the open floor plan. · Cooking comes with some side effects. When you’re cooking dinner, it’s much easier for smells to waft all through the house, rather than lingering in the kitchen—which could be good or bad, depending on what’s cooking! Additionally, heat from your kitchen will travel to other areas of the home, unimpeded by walls. · There’s a loss of formality. We mentioned that open floor plans make it easier for everyone to socialize—but then again: If you want to be able to chat with friends in the living room while your spouse slices onions and gets dinner prepped in the kitchen, an open floor plan makes it difficult to enjoy any meaningful separation. · You lose some privacy, too. There’s really no way to have the kitchen, dining room, or living area all to yourself when it’s all part of one big, open family space. · Cleaning can be more challenging, too. With an open floor plan, you can’t simply push all the kids’ toys into one room and keep them hidden there; messes and clutter tend to take up the entire floor plan. If you’re excited about the idea of a modern, open floor plan in your North Carolina home, we can help you find one; if you’re still a fan of the more traditional arrangement, we can help locate homes like that, too. At Ryan Minges Real Estate, our job is to help buyers find their dream home—no matter what that looks like. Start the process by contacting our North Carolina real estate team today!